The kraul are an insectoid race loyal to the Golgari of Ravnica. They declared allegiance only recently after centuries of living unguilded on the outskirts of the Undercity. Despite their fealty to the Golgari, the kraul are not treated as being on equal footing by the upper ranks of the guild. Mazirek, death priest and leader of the kraul, refuses to sit idly by while his people are routinely ignored by Guildmaster Jarad and his ilk. The Golgari Guildhall was an arched subterranean cathedral surrounded by an immense circular maze of fungal hedgerows and overgrown, moss-encrusted ruins. Known as Korozda, the Maze of Decay, the structure loomed, an imposing shadow in the semi-darkness of the Undercity. At its center stood the cathedral itself—Svogthos. Denizens of Above would whisper of how the cathedral was beautiful, once. Its curved arches and stony towers glistened with obsidian and silver in days gone by. But the wear of centuries left it cold and damp, heavy with the smell of staleness and soil. Denizens of Below knew it had never stopped being beautiful. Sobeslav, assistant to Guildmaster Jarad, sat cushioned in the comfort of the Guildhall. His desk attached to that of Jarad vod Savo, who could usually be found wandering the maze outside, avoiding the gaze of the public. Liches were not the social type. Sobeslav understood this and usually found it best to leave his master be when dealing with matters of state. At that moment, he was working his way through a pile of letters atop a mushroom-lit desk. His elven eyes (hooded, tired, a bit too far apart) scanned the news of Above, and he tutted and tsked at the mishandling of affairs in the well-lit places of the city. Gruul riots. Shuttering of communication between the Orzhov and the Azorius. It was for the best that the Golgari stayed below—unfortunate happenings were afoot now that the Guildpact could walk and talk and just up and leave. As he finished reading them, the elf tossed the bulletins into the rot-pile at the end of his room. The worms had more use for this news than he did. A letter at the bottom of the pile caught Sobeslav's attention. It was written on well-pressed paper and smelled of delicate moss. A shining black seal was stamped on the front. Tied to the ribbon on the front was a single mushroom. Sobeslav set the mushroom aside and opened the letter gently. The ink that was used to write was exquisite, but the handwriting was a mess of scratches and incomprehensible flecks. After a moment, Sobeslav made out what it was. From Mazirek of the kraul. He crumpled up the paper and threw it into the rot pit in the corner of his office. It landed with a soft squish. Sobeslav chuckled. What gall! Nobody outside of the kraul cared much for the kraul. Why would they? The kraul were a recent addition to the Golgari. For centuries, they had been an unguilded mass of insectoid brutes. They lived on the peripheral of society and only recently had declared allegiance to the Golgari Swarm. Never one to turn down an opportunity for more members, the Golgari accepted the pledge, and the kraul now served as laborers. The Golgari weren't ones for hierarchy, but even they knew that the kraul weren't that impactful on the rest of the guild. Why in the world would the kraul think that their guildmaster would accept a call from a small-time death priest with so little influence? Sobeslav stared at the crumpled letter with brief consideration. The invitation was just outlandish enough to warrant investigation . . . right? And certainly, Jarad would commend his initiative were he to discover some outrageous news about the kraul of all people. Sobeslav narrowed his eyes and rang a bell on his desk. An attendant poked his head in, awaiting instruction. "Assemble fifteen members of the guard," Sobeslav said. Maybe the kraul will learn something of the true might of the Golgari. The mushroom attached to the letter was meant to inform location. It was an old but accurate way of communicating a meeting place among the Golgari. Fungal systems spread throughout the guild, of course, and one strand of mycelium could stretch thousands of fathoms. Simple magic could be used to interpret location across these ecosystems of fungus and slime, and nearly all Golgari recognized the intent when gifted an unfamiliar mushroom. Sobeslav performed the spell and heard the mushroom's grove sing to him from three days' travel down and away. He groaned. Supplies were gathered and ropes were prepared. Their journey would take them far beyond and far below. 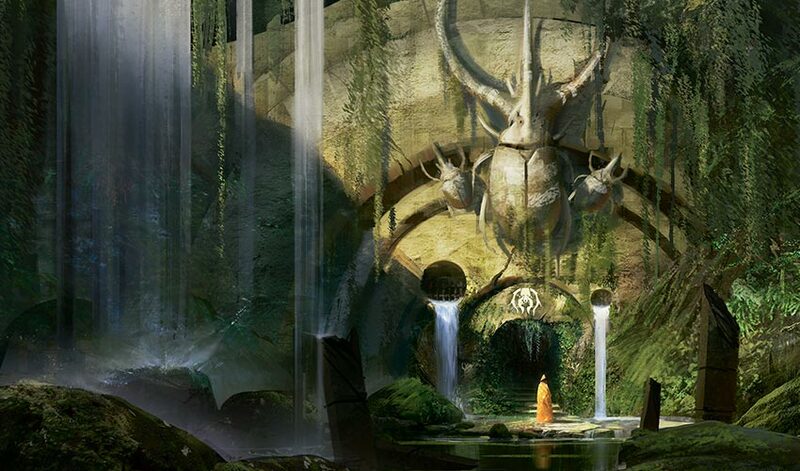 The Undercity was nearly endless, but the Golgari were wiser than to build their cities and homes in places that Below did not tolerate their presence. Where Mazirek wanted him to go rested far beyond that. Once assembled, Sobeslav and the small collection of Golgari guards began their trek and descent. The path to the mushroom's grove led Sobeslav and his guards through cave and crevice, under a deep-well waterfall and over miles of empty rot fields. The path led him farther and farther, deeper than any of the party had ever been before. Rot fields turned to sewers turned to uncut rock. The Golgari were mighty and old, but they were not foolish enough to dig where they shouldn't. As they followed the tug of the mushroom spell, Sobeslav let his mind drift. His initial dismissal of the summons had metastasized into a seed of dread, and it sprouted and grew as he continued his journey. Mazirek was a death priest, after all. The insect ways were quite strange to Sobeslav's senses. By nature, they were alien, and difficult to understand. While the Golgari took pride in never turning away the marginalized and the downtrodden, Sobeslav still couldn't help but feel wary about whatever the kraul wanted. They were new to the guild, after all. Perhaps they still retained the wildness of the unguilded. Would they be upset when Sobeslav arrived in place of the guildmaster? Sobeslav shook his head, strength and pride coalescing in his heart. It's what they should have expected. One must pay their dues before speaking with the great lich Jarad vod Savo. And so, the journey continued ever downward. At times, they lowered each other by ropes, occasionally by sucking in their chests and squeezing between boulders. On one afternoon, they passed through a cave of immense crystals that towered over them as trees would on the surface. The air in that cavern was too hot to breathe, but they pressed on all the same. The journey had fed Sobeslav's curiosity, which only mounted as the landscape grew more foreign. Where was this death priest residing? What did the death priest want? On their third morning of journeying, Sobeslav called his guards to a halt. He checked the spell on the mushroom from Mazirek and nodded. They stood in a warm, oddly large cavern. The magic of Sobeslav's spell seemed to be leading here. He sniffed and sensed, eyes piercing through the darkness. The crevice was not noticeable at first. A thin crack in the wall, with webs of glistening strands drifting delicate and gossamer over its entrance. Sobeslav felt it. A distant, long-dead chime of necromantic magic down that path. Old and far away. He shivered. It could only be the death priest of the kraul. Sobeslav called out to the rest of his guards, using a quick pulse of power to create a simple tether between himself and the others. The magic of caves was tightly wound and abrasive, long-lasting but difficult to master. Sobeslav never bothered to learn the spells of decay as the rest of the guild did. His magic was that of survival. Sobeslav went first, illuminating the way with a cave spell that lit up the crevices and hugged sharp corners. The barriers of the rock around them was outlined with the shimmer of his magic. Holds and edges stood out as they didn't before, and the crew descended in and further down. The walls hugged as tight as the air ran thin. Sobeslav exhaled as much as he could and sidled through the crevasse. Someone behind tugged on the tether of his magic, and Sobeslav pulled them forward. They were nearly there now. No time to get claustrophobic. The exit to the pressing crevasse hung in front of Sobeslav like two parallel lines. He shoved forward and stumbled out onto hard soil. The rest of his guard followed. Sobeslav stood, adjusting to the dry air, nose catching a faint musk that permeated the space. On the ground, a soft layer of membranous yellow mold coated the stone beneath his feet. Sobeslav cast another spell of illumination, this one a more general spell to light up the air above and around them. It wafted like motes of dust in the air and cast a dim light, soft to dampen the glare on their underexposed eyes. As he did so, a mild headache bloomed in his temple. He frowned—it had been a while since he exerted much magical energy, but he didn't realize he'd become this out of practice. On the far end of the room, a massive carved slab loomed in front of the group of Golgari elves. Glittering quartz freckled the slab, and careful carvings framed the stone on two sides. Were this stone found Above, one would have mistaken it for part of an oligarch's manor, but here, below the surface, it spoke of a distant and forgotten past. At the top of the slab, a single sentence, carved deep into the glistening black rock, lined the stonework. The elves didn't have time to read it. Something was . . . humming. It was a low murmur they did not notice at first. Sobeslav urged the illuminated motes to rise, and as they did, hundreds of cramped insectoid forms came into view. One of the guards fell back in surprise. The rest froze where they stood. Sobeslav felt his headache spread as his eyes took in the nightmare above them. There, clinging to the ceiling, waiting for their arrival, were the kraul. There was a brief disruption in the rows and rows of insects. A buzz of wings. A massive form dropped from the ceiling and landed to the floor of the tavern with a slime-coated squish of impact. And when it stood, a pair of compound eyes looked straight at Sobeslav with utter disdain. Mazirek clicked his mandibles and stood at his full height. Even by kraul standards he was immense. "I invited Jarad vod Savo, and I received his lapdog instead." Sobeslav cringed at the mash of clicks and consonants, Ravnica's common tongue strange and mutilated by Mazirek's mandibles. Sobeslav swallowed hard and brought his light down, shrouding the ceiling in darkness to better illuminate the death priest in front of him. His temple throbbed, and he squinted to both see and focus on the massive insect. "I am the assistant to the Guildmaster Jarad vod Savo, Mazirek. The guildmaster was indisposed and sent me in his place. What matter have you for the guild to address?" Mazirek gripped his staff. His joints clicked against each other, and his wings buzzed a shiver of irritation. Mazirek took a step toward Sobeslav, who stumbled back a half-step. "Tell me, Sobeslav," he said, "what do the Golgari think of the kraul?" A wave of sound, akin to the scream of endless cicadas, rippled from the ceiling. The realization dawned on Sobeslav that the kraul were laughing. His headache now pierced with the daggers of a migraine, and he hid a groan of pain. "The kraul are . . . laborers. Workers. They work the rot fields and maintain the sewers. They are new to the Guild, and must pay their dues." "And is that all?" Mazirek said. Sobeslav had a feeling it wasn't. Laughter hissed from the death priest's vestibules and screeched from his throat. The chuckle rose through the cavern and the kraul above. Sobeslav began to sweat. Flashes of light danced before his eyes, and his mind recoiled in agony. The endless drone of the kraul above was unbearable, and the scream of kraul laughter sent dread dancing through his bones. A sudden soft thump resounded behind Sobeslav. One of the Golgari elves collapsed on the ground, his limbs flailing in seizure. Sobeslav cursed and looked to Mazirek in fury. "We are of the same guild! We will retaliate if you continue to harm our guard!" Another guard's eyes rolled back in her head and she fell to the ground. A trickle of foam leaked out of her mouth. Sobeslav felt a jarring pain in his right side. Mazirek tutted as best a kraul could. "Liver giving you trouble?" A third guard collapsed. Sobeslav grimaced in pain. "What is this? We answered your call and we came—"
The elf fell to his knees in pain. Mazirek kneeled close to the ground, mandibles tickling the elf's ears. "My people desire a seat at the table. Renewal is constant, Sobeslav. And as you know, death is sometimes required." Sobeslav growled through the pain. "I won't let you won't kill me, kraul." Mazirek leaned in closer. "I've been killing you and your guards for the last three minutes, one piece of your brain at a time." Sobeslav would have lurched to attack, but at that moment, one of his kidneys gave out. A fourth guard collapsed to the ground. Sobeslav realized with the remaining bits of his mind that Mazirek was saving him for last. The death priest stood to his full height. "Besides," Mazirek mused, "I need a death to open the door."" Vraska dropped a spoonful of sugar into her cup. She stood in her chamber across from Mazirek, who sat comfortably perched on the cushions before her. The gorgon was preparing black tea—a delicacy the death priest had only begun to enjoy. "The kraul only function because of a sole leader of the hive. I was born into my duty." He spoke with interspersed clicks and chirps. Mazirek's kraul mandibles could only do so much with the common language of Ravnica. He was safe here. Vraska would never mock or chide her friend. The gorgon watched Mazirek recount his position with interest. "Do you ever feel intimidated by the responsibility?" She dropped no less than eight teaspoons of sugar into the cup and handed it to Mazirek. He accepted it with a thankful chirp. Mazirek dipped his mandibles into the tea. He worked his jaws side to side, sipping the tea with a gentleness reserved only for non-kraul company, and set the cup down. He clasped his upper limbs in contemplation. "I have spent my life learning our ways and training to become a priest of death. When the time came and the ask was delivered, I was ready to become the leader of my people. No other kraul holds the talents I do." 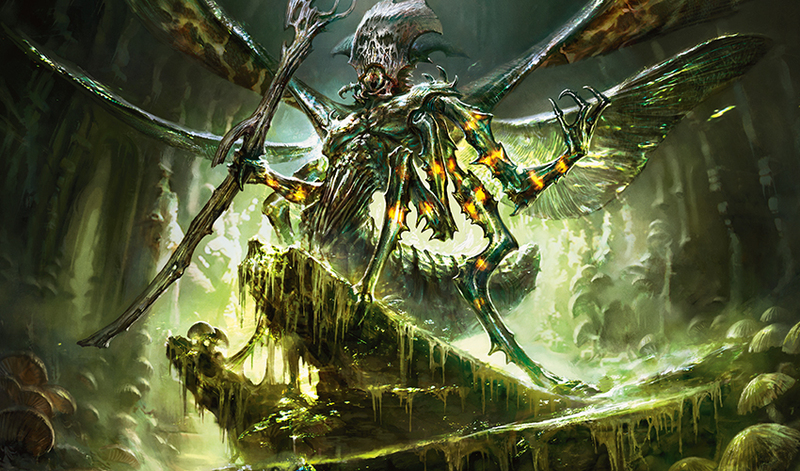 "I've been called egotistical for holding the same resolve," Vraska mused with a knowing smile. Mazirek let out a sigh and a small, resonant creak of confusion. He looked at his friend. "The kraul have no concept of 'egotistical.' Pride is irrelevant among the collective hive." Mazirek began his next sentence with a small click of confusion. "What is the purpose of pride?" Vraska set her cup in the saucer and thought. She sighed and drew a breath, trying to lend form to her thoughts. Eventually, she found her answer. "Throughout my life, many have made the mistake of not taking me seriously, as an expert or as a threat." Vraska's hands were folded before her, and the coils of her hair framed her face with a gentle motion. She looked at Mazirek with honesty in her golden eyes. "If I am to be met with disrespect, then I must first love myself with a fierceness no fool can take away." Mazirek treasured the memory of that conversation. Pride was a foreign concept to the kraul, but upon learning its purpose, he understood. He was capable of incredible things, and no amount of Golgari ignorance would ever change that. It was for this lesson that Mazirek trusted Vraska with his life. Mazirek had first encountered the gorgon once several years ago while consulting the assassins of the Ochran. 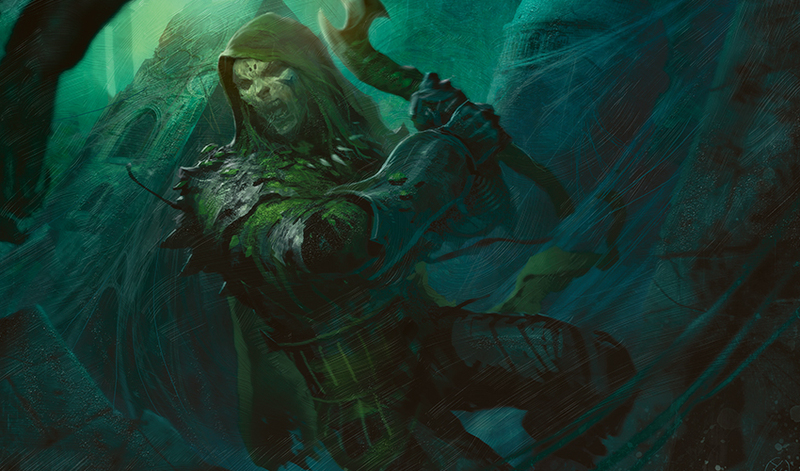 Mazirek had provided blessings and enchantments to those assassins who asked, and Vraska was the only one who engaged in conversation after. The two began meeting regularly afterward to discuss theology and politics, and their friendship had proven enriching through the years. Mazirek felt pride as he killed Sobeslav cell by cell. The elf screamed for a full minute as his pancreas failed. The death priest raised his staff to the ceiling and called for the rest of the kraul to begin their chant. He spoke in the language of the kraul; a language without flesh, a series of chitters and clicks unfit for speech with humanoid lips. The kraul answered with a chant in turn, and Mazirek began his spell. To unfamiliar ears the chant sounded like some great machine shifting and cranking in rhythm. To Mazirek, it echoed with the power of millennia, a prayer of recaptured power, a preamble to an empire waiting to be built. Mazirek led with passion and weaved magic into each note he sang. The slime underneath awoke, and the lattice illuminated with the souls of the recently dead. As more guards seized and died, their spell grew stronger. All the while Mazirek reached out and caught the power that resonated with each deceased soul, reaping their strength and channeling it into his staff. His spell was nearly complete. Sobeslav writhed and blubbered, his body betraying him as parts died bit by bit. Nearly incoherent eyes stared blankly toward Mazirek, his expression twisted in a faint facsimile of seeking mercy. Mazirek kept the parts of his brain that felt pain alive, chanting with harsher emphasis, one laced with pride. Vraska's chamber was cozy, above all else. It was a curiosity cabinet-turned-flat, with every inch of the walls covered in exquisite trinkets and objects beyond all familiarity. The colors and variety were always overwhelming for his compound eyes, but the effect wore off eventually. This was a welcoming place, a traveler's den. Above her kitchen was a dark violet banner. A clay pot with black waves painted along the rim sat on the bookcase. Dozens of little folded paper birds mingled with the ribbons that spanned her ceiling. The effect was calming and captivating; enjoying tea in Vraska's chamber was like sitting in the vaults of a museum. Mazirek paced across Vraska's sitting room. He was fuming at yet another ordinance from the guildmaster. "Jarad and the rest of the elves could not care less what happens to the kraul. He has cut back our food allotment, ignored all our requests for counsel. He would rather us starve than have influence within the Golgari Swarm. Our new allegiance is worthless in their eyes!" Vraska watched Mazirek carefully as he spoke. She leaned forward. "Mazirek, you are not alone in how you feel. The kraul, the gorgons, we have all gone unseen, been unheard, for far too long." Mazirek clicked his mandibles in frustration. "The change we need will only come from warfare. But such conflict would be too great a cost to my people." "But what if there were a way to do it without bloodshed?" Vraska asked. Vraska took a sip from her cup. She smiled and raised her shoulders quaintly. "There are plenty of ways to enact change without shedding blood." Mazirek ceased his chant. The kraul above read his pheromones and scuttled down to the floor of the cavern to join him. Sobeslav yet lived. He gasped with a single lung, eyes unable to focus. Mazirek leaned down and held his staff above Sobeslav's head. A singular sentence escaped the elf's lips. "A kraul cannot lead the Golgari." Mazirek cocked his head and clicked his mandibles. "You're right. And I won't." The tip of his staff moved to the back of Sobeslav's neck. "But I know who will. And you will help me attain the means to their ascension." The last draw of power. The fluttering sigh of sacrifice. Sobeslav's eyes went wide as his brain stem suddenly decomposed. The elf that was Sobeslav lay prone at the feet of the death priest. Mazirek buzzed his wings in joy, and pulled the strength from the elf's dying body into his staff. The kraul around him cheered and began a chant of encouragement. Mazirek inhaled with a huff of his vestibules and concentrated on the obsidian slab before him. Mazirek clutched the staff in his middle hands, dug his bottom legs into the lattice of the slime below him, and pulled upward with his power. Through the fibers of the slime and the fungus at his feet, he tugged, and a current of necromantic power leeched upward into him. The power of sixteen fresh souls chilled him from head to feet, and Mazirek wove a quick spell in his mind, converting the death he pulled from the slime below into kinetic strength, combining it with the vibrant death he had just reaped. He gripped either side of the stone slab and shoved it to the side. He had wanted the guildmaster to witness this, to suffer an end as the kraul laid claim to this great power. But Jarad's time would come soon enough. A waft of air rushed out at him as the seal of the slab was broken. The inside of the chamber was pitch black. He could immediately sense that the mausoleum was old. The place had the stink of several centuries. The kraul behind him crowded around and peeked into the chamber. In front of them was a cavern so large they could not sense its walls, and placed like soldiers in formation across the grid of the mausoleum floor were hundreds of stone coffins. The ceiling was stately and ornate, gilded and painted to trick the eye into perceiving it as sky above. Everything about the space spoke of deep, ancient wealth and power. As he stepped into the mausoleum a current of magic vibrated over the stones. Mazirek sensed he had triggered an ancient spell, and watched with delight as every single coffin began to loosen itself. Mazirek buzzed his wings with pride. A kraul drone scuttled next to him with a question in her scent. "What are they called?" she asked in kraul. Mazirek stood to his full height, staff sweeping in grand gesture over the rising army before him. "Behold, child: Umerilek, Mausoleum of the Erstwhile, the salvation of the kraul and the key to the creation of the Golgari empire."